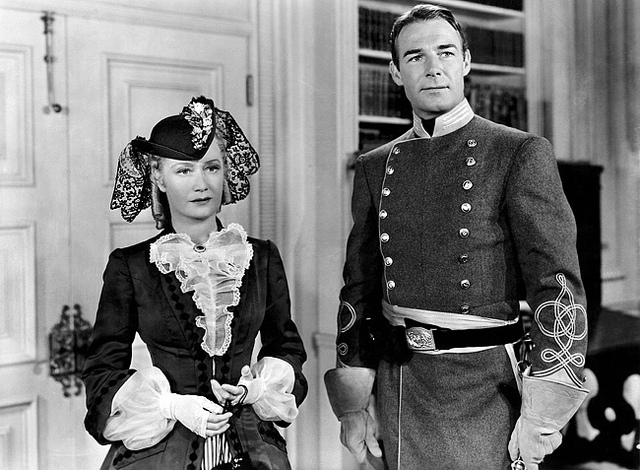 Errol Flynn is Irish-born Kerry Bradford, a Yankee captain in Libby Prison in Richmond, Virginia, in 1864. 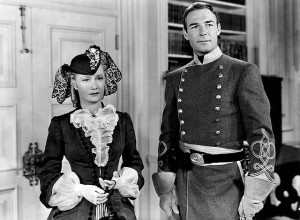 Col. Vance Irby (Randolph Scott) is the commander of the prison and is on the verge of spoiling Bradford’s attempt to tunnel out when he is given another assignment—to help Confederate sympathizers in Virginia City smuggle $5 million in gold back to the dying Confederacy. 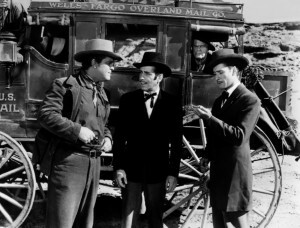 Meanwhile, Bradford succeeds in his escape, with friends Moose (Alan Hale) and Marblehead (Guinn Williams) and the three of them are sent to foil Irby’s plot in Virginia City. 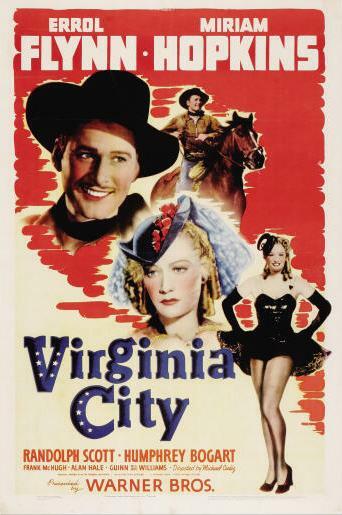 Once in Virginia City, Bradford falls in love with saloon girl Julia Hayne (Miriam Hopkins, usually better in more urban roles) whom he meets on the stagecoach, unaware that she is a Southern agent. During this period, Scott was often cast as a noble bad guy trying to reform (see Western Union, for example, in which he was also named Vance). The Confederates get away with the gold, taking Bradford as a prisoner with Julia’s connivance. He escapes and manages to get the Union cavalry on their trail through the desert. In black and white, but apparently with high production values for its time. Shot in northern Arizona. Good score by Max Steiner, with threads of “Bonny Blue Flag” and other Civil War tunes. 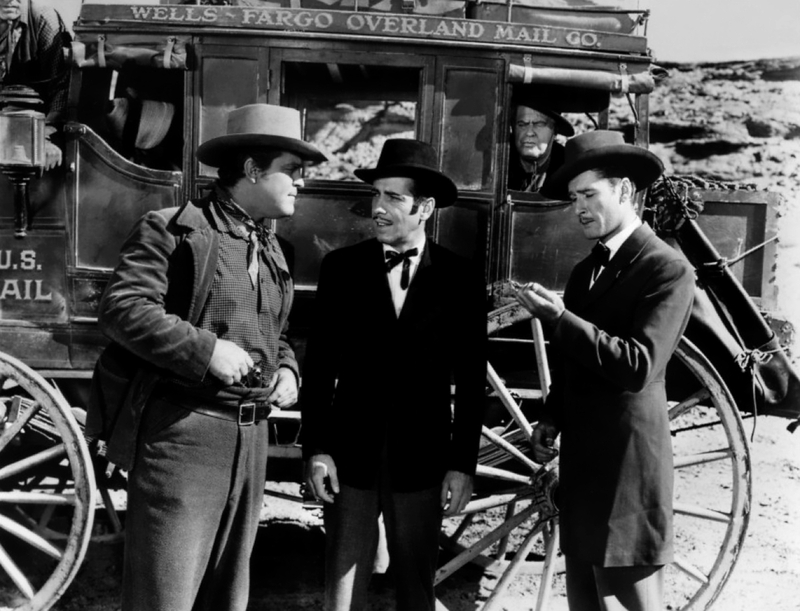 Hale and Williams are Moose and Marblehead, Bradford’s companions and comic relief, sort of, as in Dodge City the previous year. 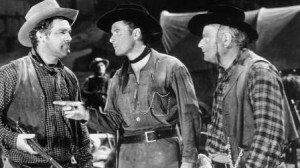 In addition to several of the actors, the director, the cinematographer (Sol Polito) and the composer, the writer Robert Buckner is also the same as with Dodge City. This is not really a sequel to Dodge City, though. When shooting a pistol, Williams seems to fling it around in a way that would make any accuracy impossible, much like James Stewart in Destry Rides Again the previous year. This was the ninth of twelve movies that Flynn made with director Curtiz, although they casually loathed each other. They did well together, though—here as in other efforts. 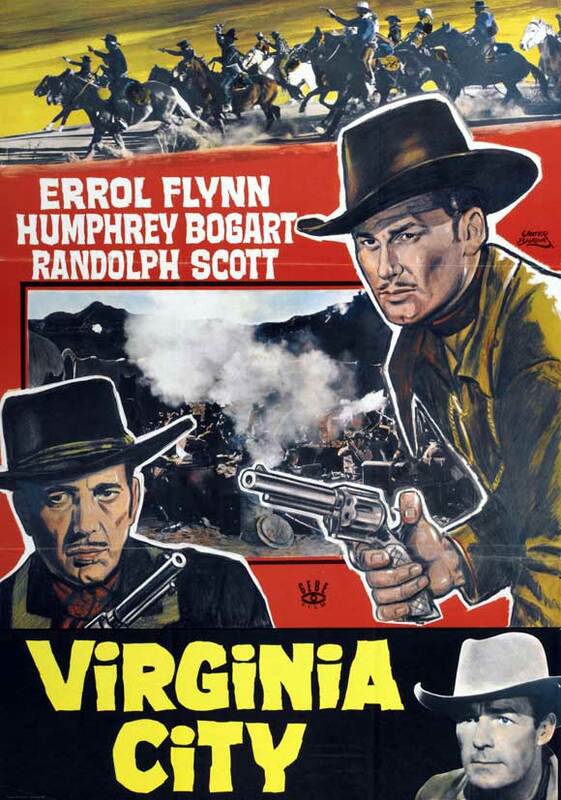 This entry was posted in Westerns Worth Watching and tagged Civil War, Errol Flynn, Humphrey Bogart, Randolph Scott, Wagon Train Westerns on October 9, 2013 by Nicholas Chennault.